In mid-2009, Dave and Val Marshall were camping when a friend had to get her dog away from an adjacent campsite quickly, only the dog’s leash wasn’t nearby. The Marshalls thought what was needed was a leash that could be attached to the dog’s collar, so it would be easy to access, right away. Less than six months later, they introduced the Leash Locket™, a unique twist on the retractable dog leash. The LeashLocket has a flat nylon tape-style six-foot long leash that retracts into a small plastic case that can be gripped in your palm. I tried out the large size (pictured), which weighs less than 4 oz. and is recommended for use with dogs up to 90 lbs. There is also a small, for dogs up to 55 lbs. 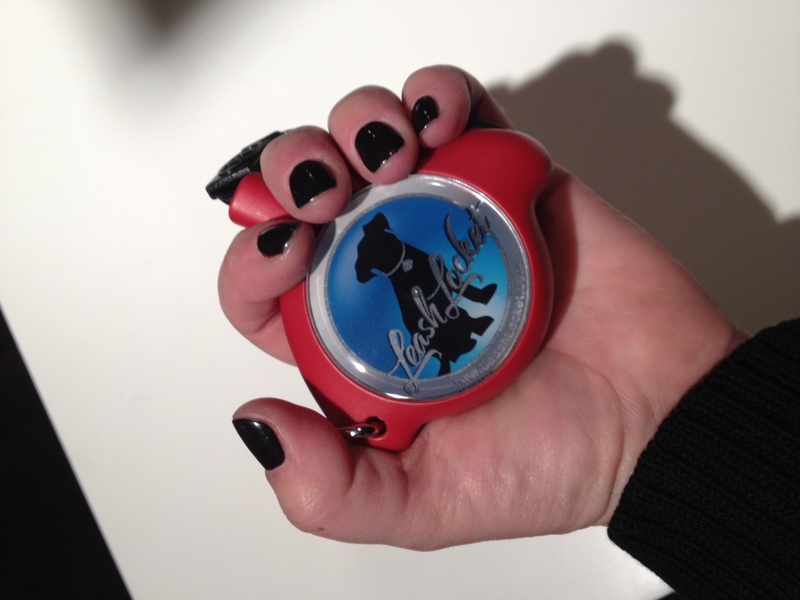 The LeashLocket fits comfortably in your hand, and is less bulky than other retractable leashes. 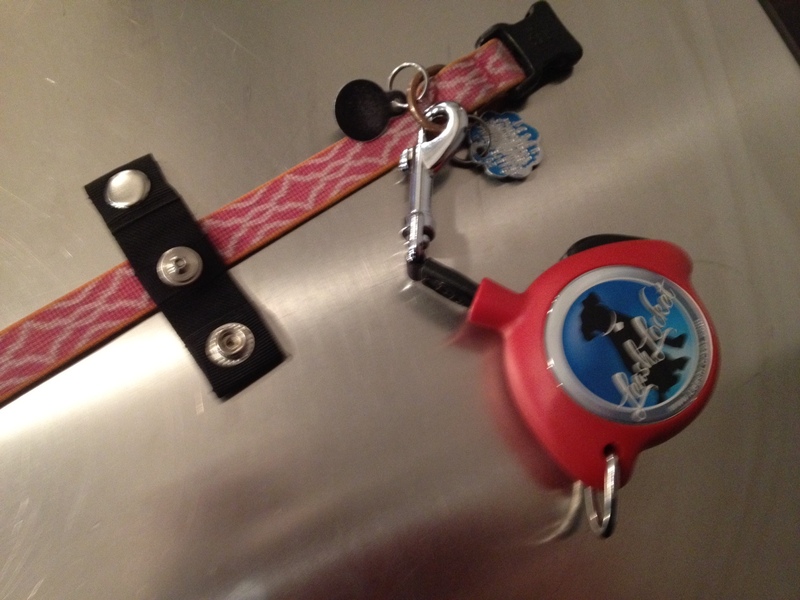 It has a button on the top that is easy to reach in order to lock the leash at a specific length, and to release it. There is a small strap with a magnet on it that you snap onto your dog’s collar. 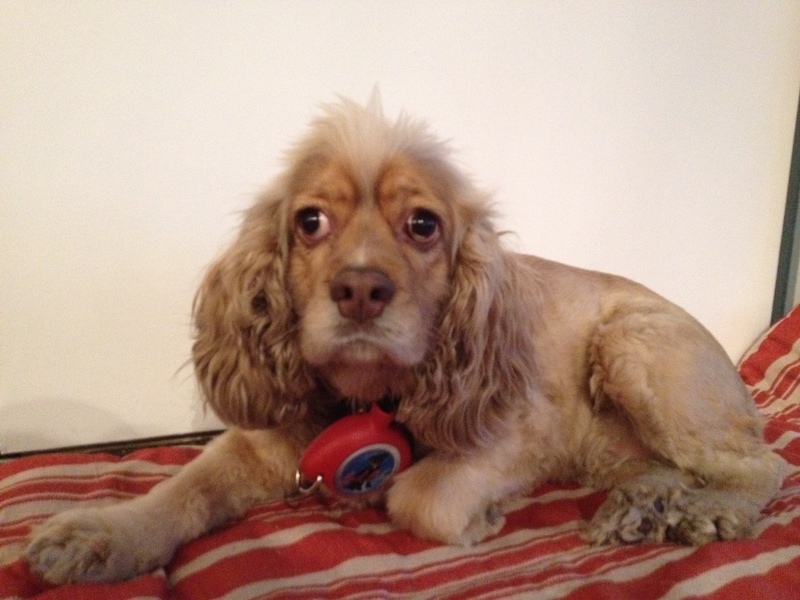 When you want your dog to carry the LeashLocket, you clip it onto the strap and the magnet holds it in place. For those times when you need to use both your hands, there is an optional wrist strap you can order that lets the LeashLocket hang from your wrist. I found this very convenient for some situations, like when I needed to pick up poop or reach into my pocket for my keys. But when I used the wrist strap while walking or running, the LeashLocket banged against my hand and leg, so it’s probably best to grip it in your hand while walking. The Leash Locket worked well with a 40-lb. Cocker Spaniel (pictured) who lives in New York City. The small size, retractable leash and wrist strap made it very convenient for a well-behaved dog in city crowds. For a large a Retriever, though, I didn’t feel like I had as much control as I do with a regular 1-inch wide leash that has a looped end that I can wrap around my hand when the dog pulls. The leash itself is very strong, the company’s website says independent testing of the large size withstood a pull force of up to 280 lbs. But I need something to brace with when my dogs see one of their puppy buddies down the sidewalk, or a squirrel races up a tree right in front of us, and the LeashLocket case–it’s only about 4 inches across–wasn’t big enough to get a strong, solid grip on. Overall, I think the LeashLocket could be a convenient alternative for owners of small to medium, older and less active, or very well-behaved dogs. The Leash Locket sells online at www.leashlocket.com for $24.99 plus $4.99 shipping. The optional wrist strap is $3.95. I was asked to write a review of the LeashLocket for this blog and given the product at no cost to test.